Internet giant Yahoo has asked a US court to dismiss a lawsuit accusing it of complicity in rights abuses and acts of torture in China. The firm filed a motion for dismissal saying its Chinese subsidiary had no choice but to comply with local laws. Yahoo is being sued by the World Organization for Human Rights for sharing information about its users with the Chinese government. The information has led to the arrests of writers and dissidents. One journalist cited in the case was tracked down and jailed for 10 years for subversion after Yahoo passed on his e-mail and IP address to officials. In its 40-page response to the lawsuit, filed with a federal court in San Francisco, Yahoo acknowledged releasing information to the Chinese government. But it argued that there was little connection between the information the firm gave and the ensuing arrests and imprisonment of its users. Yahoo said that while it did not condone the suppression of people's liberties, the firm had been compelled by local laws to hand over the information that was requested. "Defendants cannot be expected, let alone ordered to violate another nation's laws," the company said in its filing. But Morton Sklar of the World Organization for Human Rights said the company had failed to meet its ethical responsibilities. "Even if it was lawful in China, that does not take away from Yahoo's obligation to follow not just Chinese law, but US law and international legal standards as well, when they do business abroad," he said. The human rights group brought the case on behalf of several plaintiffs, including the Chinese journalist, Shi Tao, and another named Wang Xiaoning. Shi Tao, who worked for the Contemporary Business News in China, was jailed for 10 years in 2005 for "divulging state secrets". He is believed to have posted an internal Communist Party message warning journalists about the dangers of social unrest resulting from the return of dissidents for the 15th anniversary of the Tiananmen Square uprising. Wang Xiaoning was also given a 10 year sentence for "incitement to subvert state power" after publishing pro-democracy material online. The BBC's David Willis in California says the case has prompted debate about the responsibility of US internet companies to protect the anonymity of users in the countries in which they operate. Yahoo is not the only internet company accused of collaborating with the Chinese authorities, which operate strict laws to regulate the internet. Rival Google freely admits to blocking politically sensitive items on their China website. 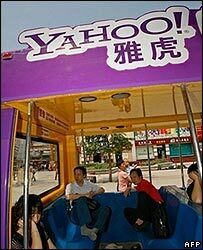 Whole websites - including media sources - are eliminated from Yahoo and Google in China. De-listed sites are skipped over when the search engine trawls the web for results. 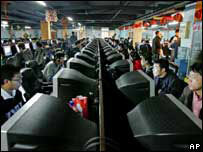 The internet firms argue it is better to offer Chinese users some information than none at all.